"Star Reacher" (formerly "Algae") takes place on a fictional planet called Diamanta, where it’s almost always cold. I imagine it being kind of like “planet Alaska” or “planet far-north Canada”. One of the main industries there is mining–specifically, iron mining. They mine the ore, process it, and then use a cannon-like device to shoot it up to an orbiting space station, where it’s turned into steel. In this story, my main character is a diesel mechanic (and an aspiring artist) who has decided to leave the planet and move to the space station. He has set aside a vacation day to finish one last art project—a metal sculpture—but he’s unexpectedly called back to work for a repair job at one of the mines. As he and his coworker drive to the mine, in the dead of winter, across the surface of a frozen lake, they come to a spot where the ice has begun to inexplicably and rapidly melt. I did a lot of research for this story. In fact, I’ve never had to do this much research for a story before! I thought it would be fun to show some of the things I’ve been reading and learning about. Here’s the Ekati Diamond mine near Yellowknife in the Northwest Territories, Canada. It’s located in an area of permafrost and is only accessible by air, or via an ice road during the extremely cold winter months (as depicted in the TV show Ice Road Truckers). The mines in my story operate under similar harsh cold weather conditions. Work goes on round-the-clock in temperatures as low as -60°F (-51°C). A truck and excavator at a coal mine. Lately I’ve spent way too much time looking at pictures of mining equipment and heavy machinery. Whenever I pass a construction site, I’ll be looking over there going, “Ooh! What machines do they have?” I also get all excited about things like the most powerful diesel engine in the world and autonomous trucks that drive themselves. An ice road over a frozen lake in the Northwest Territories. Pic from here. 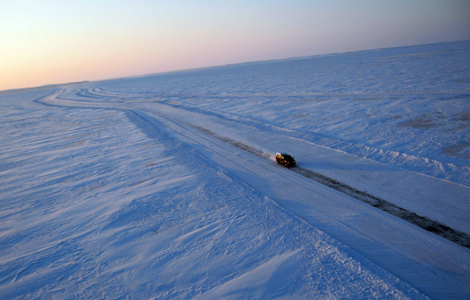 Ice roads are used in situations where building a real road would be too expensive or unfeasible, in very remote locations and/or in the presence of boggy land. The Tibbitt to Contwoyto Winter Road that provides access to many mines in NWT is 353 miles (568 km) long and the speed limit is 25 km/h (16 mph). The road in my story is more like 200 miles long. A cutaway view of the Stanford Torus, a type of space station. Pic from here. Other designs for space stations include sphere and cylinder shapes. Theoretically, many types of manufacturing could be done better in space, because of the ready availability of vaccuum, which is essential for many industrial processes but takes effort to create on a planet’s surface. For my story, I imagined that they would be able to produce higher quality steel there than on the surface of Diamanta—steel that would eventually be used to build things like spaceships.